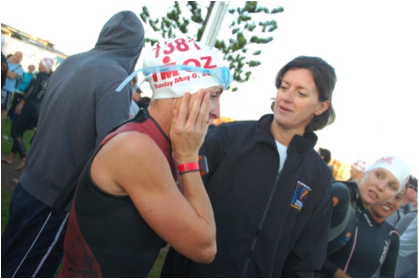 Kath Wilkinson - My first Ironman 2012. 12 months ago, I signed up to one of the biggest challenges that I once thought was un-achievable! I have been competing in triathlons with the Balmoral Tri Club for the past two seasons. Myself, along with a group of friends decided we wanted to do the Ironman. After a nerve racking experience just getting a spot in the race, we did it, committed and started our journey to our first ever Ironman event! Some of us knew from the start that we would only be keen on doing one Ironman, my answer to this question when asked was… “I will decide if I’ll do another one after I finish my first one. The year got away and before I knew it, it was January 2012 and the ironman was only 5 months away. It was time to start seriously training for the event. I raced my first half ironman in November 2011 in Shepparton. It was hard work. I really struggled getting my nutrition right and although my swim and ride were ok, the run was long, slow and painful. What I learnt from this was that I needed to work more on my nutrition and running training. Since running was my strength I actually didn’t focus too much on the running in my training and this contributed to an un prepared and low run performance to finish my race. All experience to learn from!! I started my ironman training off with a week training camp at Jindabyne with the Energy Link coaches, Chris and Bruce Thomas. This was also with a lot of Balmoral Tri club members. We spent the week riding and running through the beautiful Thredbo and surrounding mountains. Swimming in the cool lake Jindabyne. This was an amazing experience for me, spending time getting to know and learning from experienced athletes. From here I started my 15 week training programme. For the first block, I was living in Melbourne during the week and coming back on weekends. I would do all my running and swimming training weekday mornings and evenings and the long rides on the weekend. It was approx. about 10-12 hours of training for the first block. Building slowly each week! I enjoyed the training; it was a shock to the system doing 1.5 hour swim sessions..... But I got used to it and could feel the difference in my swimming in a very short period of time. Swimming has always been my weakest discipline as it was only toward the back end of 2010 that I learnt to swim properly. Saturdays began with Bobbin Head hill repeats and a run off the bike. This was great to get our strength built up in our legs. Each week we could see a slight improvement but still struggled up that 4km slow incline!!! The Sunday rides were great. A bunch of us would get together and set out early in the morning to do our rides. Starting the first weeks at 3-3.5 hour rides, slowly building up to 7 hour rides towards the end of the training programme. Yes your social life does suffer!!! During the training period, I raced the Huskie long distance as part of training. I like race practise so it was good to get out there and see what has worked for me in preparation, nutrition, clothing etc. After the race I spoke with Chris my coach about nutrition. I struggled with this again. Needing to go to the toilet too often and also feeling ill and having to vomit in the first half of my run! Chris put me onto a natural path Kira Sutherland. I went and spoke to her as she works a lot with triathletes and race nutrition. She listened to my issues and we put a plan together to practise with. My biggest issue was that I didn’t like the sweetness taste in my mouth and this is what made me feel sick and seemed to be going straight though me!! The main reason for this was I was not consuming enough water with each gel. I also found the gel that suits me and that was cola/vanilla shotz. I trained with this nutrition plan and it worked, I felt good and confident with it. 50g of Carbohydrates an hour is what my plan was and I combined this with a gels and solid foods like sandwiches, energy bars, snakes etc…. Cut out electrolyte and replaced that with salt tablets. This was to try and cut out some of the sweetness and through training it seemed to work! The other thing Kira picked up on was that I wasn’t getting enough sleep. I was averaging 6-5.5 hours and I needed 8. So I started going to bed earlier during the week. Took a bit to get used too but it worked! In late March, we had an ironman training weekend. All the other guys I was training with that have done ironman several times, kept saying, if you get through this weekend, you will have no worries finishing the ironman. So was expecting a tough weekend ahead! Saturday was a 40km TT then an hour run off the bike. 1 hour ocean swim in the afternoon. Sunday was a 165km bike ride that took most people around 6-6.5hours. It took the few I was training with, 7-7.5 hours, then a 20 minute run off the bike! We loved it! It was a great weekend and felt very emotional and liberated after finishing it. Knowing that my ironman journey was only 6 weeks ahead of me and for the first time, I was starting to feel like I was ready and going to be able to achieve this ultimate challenge! 6 weeks out and our schedule was approximately 20 hours of training. I was back living in Sydney fulltime now which made things a lot easier as fitting in flights early Monday morning and late Friday evening were now not required! Extra sleep time, yah! The following weekend, 1st April, I was out for an easy recovery ride with a couple of my training buddies. One of them took a nasty fall. It was really horrific seeing this happen to one of your best friends, right in front of me and not be able to do anything to help her! Scary! The accident resulted in my friend having a broken jaw and facial bones broken in many places, lost 3 of her front teeth and severe lacerations to her lip and face! She had to have her jaw wired together and plastic surgery on her face, followed by some major dental work when this was all healed 5 weeks later. As a result she was going to miss her first ironman. Being this was my main training buddy, this threw me off track for a few days. Thanks to a couple of my other training friends, they got me back out on the bike the following weekend and we did a long 7 hour ride. This helped us all become more focussed again on the race….. It was tough not sharing the rest of the journey with my close friend but what happened to her kept me going to get ready for the race and do it for not only me anymore, but for her too!! A few weeks prior to the race I was starting to feel over whelmed by it all; A lot of other stuff going on and the reality of the race only being a few weeks away….. It all got on top of me! Another training friend studies Life coaching so she seen that I was struggling and offered to come and talk to me about it all. We spent about 2 hours together and what a world of difference that made. All she did was walk me through the few weeks ahead, including race weekend and I organised myself on paper and in my head. I was more prepared then I realised and this helped me settle my nerves. One thing she focused me on was some meditation in the morning and evening. This was amazing as it helped me sleep soundly and in the morning, I had a fresh clear head to balance my training with work load! On our last weekend of training prior to race day. My two friends and I, set off for our last slow, easy 3 hour ride. We only got an hour into the ride and one of them clipped the back of my wheel and went down. She fell quick and Hard! This gave us all another scare but she seemed to be ok. No broken bones however a fair bit of skin off and a significant knock to the head causing some mild concussion. After a painful week for her she decided to make it to the start line of the ironman race only 7 days later! So the Thursday came and off we went up to Port Macquarie. I travelled up with my two friends mentioned above. It was a car journey full of emotions… Excitement, nerves, un- certainty and anxiety between us all. As soon as we arrived I just felt ready! Felt ready to race and wanting to soak up the whole weekends atmosphere.. Enjoy the virgin ironman experience as you will not ever have that again! Moved into my accommodation for the 5 days with two guys from the tri club. This was great as they both have done several ironman races so I was able to learn from both of them as the day drew closer. Going to register was so exciting and surreal. Getting your wrist band, signing your name on the wall, getting all your information and packs ready to get organised.. Oh it was buzzing.. I had a couple of light training sessions, a ride, run and quick swim in the lake… This of course was with others from the tri club that were all feeling the same emotions. Excited, nerves, anxiety etc…. IT was great!!!! We had a welcome dinner on the Friday night. Guest speakers, the introduction of some of the pro racers and all of us first timers! They asked all the first timers to stand and the roar of cheers was electric! How amazing and as I said earlier, the only time you will experience that so I soaked it all up! One of my most memorable guest speakers was Daniel McPherson. He said a few things through his speech; however the one thing he said that stuck with me the whole rest of my journey was…. If this is your first time, please enjoy every minute of it, the nerves, the pain, the no sleep the night before, the loss of appetite, when you are struggling in different parts of the race………….. ENJOY IT ALL as it is the ONLY TIME YOU WILL EVER EXPERIENCE THIS FOR THE FIRST TIME…… This was already my motto, however he just reinforced it. I did just that!! Race morning…… The rule in our house was no talking in the morning! (Slight tongue in cheek..) However as it turned out, that suited me just fine as I was feeling very sick, nervous and extremely emotional. So the last thing I wanted to do was talk! We headed in to transition early. Race started at 6.45 but we had to be out of transition by 6.15. So we got there with plenty of time to spare so we weren’t rushing and stressing…. I had an issue with my bike when I got there. On the front wheel, the valves had disappeared into the tire and I couldn’t pump it up. I let the air out the night before but maybe should not have let all of it out!!!! Not what you want on race morning but I didn’t stress, just walked my bike over to the mechanics and got them to pump it up for me! Everyone was fluffing about but I just tried to keep to myself and control my nervous energy! All sorted so I headed out to find my friend’s that were there to support. Including my good friend that couldn’t race due to her bike accident 6 weeks prior… (Special mention also to one of my best friends Tarn who come up from Melbourne to be my number one supporter, she was amazing all day keeping my family and friends in the loop via text, facebook and phone calls of my progress throughout the day!!!! They all loved it and appreciated her as much as I did!!! My injured mate was there to support even though it was extremely tough for her to sit on the side lines when she did the majority of the training with us and couldn’t start the race. I found her and she was clearly upset. I took one look at her and my emotions that were built up that morning…… exploded!!! We had a HUGE hug with lots of tears…. This helping each other for different reasons!!!! She gave me the strength to front up to that start line and race for the both of us!!!! I thank her so much for making the effort to come and support all of us racing, knowing how tough it was going to be for her!!! Very brave and selfless lady! So there wasn’t much time left till the gun went off. We all rallied together with a huge amount of people from the club there to support us. Lots of hugs and well wishes, while we all got our wettys on and headed to the start line. Having Chris my coach there for the start line and to help settle my nerves was definitely something I appreciated and remember very clearly! As a few of us entered the red carpet leading us to the water, the Australian anthem played. OMG that was one HUGE highlight for me! It felt so good being a part of it all….. The nerves were there but the excitement started coming back. 3-4 months of hard training was about to pay off as we made our way to the start line! All we had to do now was go hard, enjoy….. and soak it all up as the next 12 – 13 hours unfolded! The swim was like a washing machine. Just short of 1500 people trying to find their own space in the lake and set off on their 3.8km journey. I found the first lap quite frustrating not being able to find any space. As I am not a great swimmer I tried to stay to the back, however I seemed to catch people and then not be able to overtake them and then people would run into the back of me! I believe there is some learning to be had for this discipline but at the time I was just focussed on finding some rhythm and not tiring myself out too much. First lap was over before you knew it and as I entered my second lap I started to find that rhythm. I felt a headache coming on while swimming my last few hundred metres, so my thought process was to take my time in transition and get some fluid in me and get my head right before heading off on the bike. 1hour 18 minutes and out of the water running to T1 As I left the T1 after spending a bit of time getting my head right, I heard my first lot of cheers from some of the BTC crew and it got me pumped. Then I come around the first corner to head into town and there was my good friends screaming at the top of the voices and wishing me luck for the ride leg.... Then into town and some more BTC crew on the corners of the route cheering me on…. WOW… IT FELT AMAZING. I settled into my ride nicely, keeping on top of my nutrition and fluid intake like clockwork! It was all going to plan when I dropped my first sandwich! Oopps…… Lucky for me I had planned that into my race and had a spare one in my special needs bag that I was able to grab on my second lap! Phew!!! I was so proud of myself for being organised as I’m generally not a natural organised person! Thanks to all the expertise around me on the lead up to the race, I was able to organise myself beautifully! The biggest thing for me, whether it be the right thing or not I’m not sure…… is not knowing the course. A lot of people like to know where they are riding, where as I would rather the surprise. Prior to the race I heard all about this Matthew Flinders hill from all my training buddies. I was riding the whole first lap not knowing what to expect and when to expect it! I thought I had gone up the hill already so when I hit the town centre area and actually road up this hill, I thought to myself, “s**t….that was harder than Matthew flinders….” It wasn’t until the second lap that I spotted a sign saying Matthew flinders road and realised……THAT hill, in fact was MATTHEW FLINDERS HILL…!! So my second go at it…….was harder!!!!... Maybe it was due to the realisation it was MFH….. Or could have been the fact that I had just churned out the almost 180km on the bike already!! Not sure what it was but I got up it both times and was proud as not everyone could conquer that!! Coming through the town there were lots of BTC people everywhere cheering, screaming and having a great time supporting all of us racing… It was the best feeling having so much support there to make you feel not only special but encouraging you to keep going strong!! 6hr.48 minutes later……The ride was over and I was off my bike!! Ready to hit the ground running…. Literally! Quick change of clothes, toilet stop and sunscreen top up, I was off and running. Felt great! Legs were rolling nicely and I felt strong. Started my race at about 5.40 minute kilometres which was a little faster than expected, so I just tried to settle into a comfortable pace.Seeing other triathletes out there cheering each other on, along with the huge support crew all over the run track. We did 4 laps so it was so cool coming up to the big hill where the BTC had planted their tent as you knew there were lots of high fives coming your way! There were different spots along the course where you knew someone was. Tarn was just after I got each band and entered the next lap, Chris my coach was out on her bike along the long stretch of the run, along with a few of the girls driving out there to cheer us on. The feeling of it getting dark and everyone getting their fluorescent glow sticks pinned to their race clothes was unreal! I could hear people finishing and the compare saying……. Bla bla.. YOU ARE AN IRONMAN……. This kept me going as I knew I was nearly there!! knew I had a couple of hours to go. I had to dig deep during this period as I was starting to really hurt for the first time. I kept to my race plan, taking one gel at the same spot each lap. Drinking water and coke along the way to keep my fluid and carb intake up at 50g per hour. I was keeping consistent but had slowed my pace back a little between the 30-40km stretch. I was hurting and wanted to just finish as quick as possible! The last few km’s I picked my pace up again as I was on track to exceed my goal of sub 13 hours! I was going to do it and I was so excited about the finishing Shute. That’s all I could then think about, I had to keep bringing my thoughts back to my form to keep me strong for the remainder of the race but….. that was hard to do!!!!!! Eventually it was my time…………….. I picked up my last band, and only had the 200 metres to go!!!! Entering the finish Shute was the most amazing and surreal feeling ever. It was dark, people lined the Shute thick and light shining down on it all! I could see all my friends and I just got so excited… running and slapping hands like some crazy woman!!! I was so excited I didn’t even hear them say…. Kathleen Wilkinson you are an IRONMAN!!!!!!! I was stoked, I had done it and I had done it well under my goal and felt strong the majority of the day!!!!! 12.54.40 was my official time!! Off I went into the recovery tent…. Had a little massage on my legs, some food, warm clothes and then out to find Tarn. Here she was waiting at the exit with tears rolling down her face….. That was when I first cried and realised what I had just achieved!!!! I AM AN IRONMAN!!!! 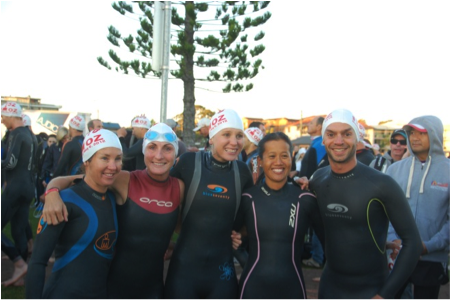 ….One month later, I have signed up again, 2013 Port Macquarie, here I come!!... I have the bug and want to continue with this distance of triathlon. I love the sport, the social aspect and the joy it brings in finishing each race!!! A HUGE THANK YOU to my coach Chris, the BTC Club and all my friends and family for getting me to the start and finish line!! !